After the events of this year's Congressional Baseball Game, Wednesday's Congressional Football Game has taken on greater weight. Practice for this year’s Congressional Football Game was held at an undisclosed location in D.C., after the shooting that took place at practice on the eve of the Congressional Baseball Game. WASHINGTON – In June, the Congressional Baseball Game transformed from a little-known, inside-the-Beltway tradition to a national event emblematic of the fractured, fragile state of our democracy. When a gunman opened fire on the Republican practice the day before the game, injuring four, including Representative Steve Scalise (R-LA) it thrust a national spotlight on an event intended to bridge the ever-growing fissures in a politically divided Washington. Four months later, it’s hard to say anything has gotten better. But Wednesday’s Congressional Football Game brings another opportunity for a public display of bipartisanship, as well as support for the Capitol Police, without whose presence that June day countless of those at practice may well have died. 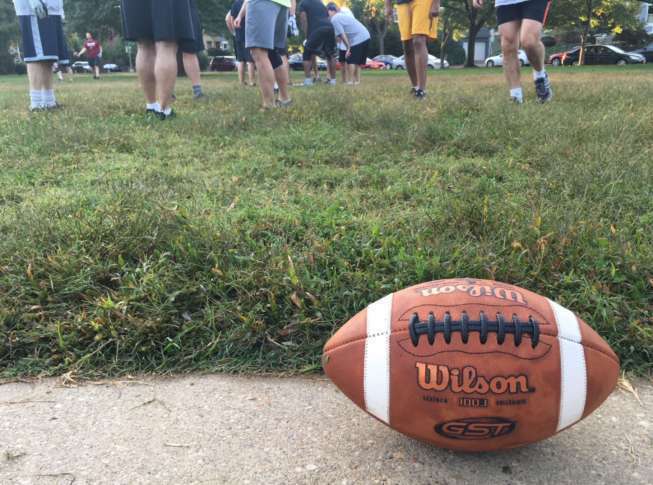 The game kicks at 7 p.m. at Gallaudet University, with proceeds benefitting several charities including the United States Capitol Police Memorial Fund, which provides assistance to the families of offices killed or wounded in the line of duty. There are actually numerous sporting events in which Congressional members play each year, but the Congressional Football Game (touch, not tackle) has the unique distinction of being the only one where members play together, on the same side. Along with a handful of former NFL players, they take on a team made up of Capitol Police, the men and women charged with protecting them. All you have to know about how the dynamic has changed is to know that practices were held at an undisclosed location in the D.C. The extra level of secrecy and security are a constant reminder of the elevated caution and awareness after what happened in June. Several congressmen who were at Eugene Simpson Park during the attack, including Rep. Chuck Fleischmann (R-TN), are playing Wednesday. Fleischmann had been standing over on the third-base side of the field shortly before the gunman opened fire and had to jump into the dugout for cover. The shooting hasn’t scared off Fleischmann or other potential participants from the game, a biennial affair that began in 2005. If anything, it seems to have steeled their resolve. It has already translated to new faces at early morning practice. “Even members that have been here for many years but never played before have come out this year to show our unity,” said Denham. It’s a reminder that sports play a unique role in uniting communities in fandom and a shared purpose, and that they can provide their own form of healing. Fleischmann hopes Wednesday’s game might be a further extension of that process. Of course, these days, our sports – particularly our football – are also reflective of the greater issues that plague our society. The ongoing saga of the NFL’s continued distortion of the meaning behind its players’ peaceful protests has dragged on over a year, with seemingly a new twist and turn each week. It’s perhaps unsurprising, though still disheartening, to find the opinions about those protests continuing to break along party lines. “I think that there’s a time to protest, and certainly the opportunity to express your concerns, but our flag and our national anthem is not the right location or place,” said Denham, an Air Force veteran who lives in Colin Kaepernick’s hometown of Turlock, California. Regardless of where they stand, both sides seem aware of how that public division in Washington has spread into seemingly every part of all of our day-to-day lives. That makes Wednesday more than just about bipartisanship between a handful of congressmen. When the Democrats gave the Congressional Baseball Game trophy back to the Republicans after the final out of this year’s game in tribute to Scalise, the scene was the kind of made-for-the-90-second-sports-package moment that viewers at home could smile easily for. Wednesday’s game will surely raise money for worthy causes and provide more opportunities for telegenic moments. But what’s accomplished in its aftermath will either validate or vacate their significance.